As winter blows in hard and strong, many people turn their attention from outdoor activities to indoor exercise regimes--back to the gym, the indoor pool, community yoga classes. Real Bodywork's Restorative Yoga Practice offers a pleasant alternative to the rigorous "no pain, no gain" approach typical of Western fitness routines. 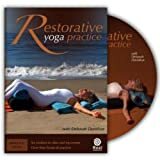 This DVD, featuring seasoned yoga teacher, Deborah Donahue, offers a variety of sequences, intended for use at various intervals throughout the day, from a brief morning wake-up and centering routine, which can be fit into the busiest schedule, to a midday relaxation break, to extended practices for evening wind-down and promotion of restful nights. Each sequence is designed to elicit what mind-body medicine pioneer, Dr. Herbert Benson of Harvard University, calls "relaxation responses," proven to nurture health and wellbeing--mentally, physically and spiritually. Mind-body practices have increasingly entered the public eye, as epidemic rates of stress, anxiety, and depression drive people in industrialized societies to disease, medication, the self-medication of alcohol and drugs, and even violence. In recent decades, scientific studies have granted scientific corroboration to the mind-body practices, long reserved for "flakes." Relaxation practices have been unequivocally proven to be a favorable alternative (or complement) to the anti-depressant drugs, which are in broad use today, despite their plethora of negative side-effects and their low rates of success (clinical studies reveal that 50% of depression pills are no better than placebos). However, one challenge that continues to stand in the way of broad adoption of mind-body practices in the United States, according to Dr. Benson, is the lack of available teachers in rural areas to train would-be practitioners. Restorative yoga practice fills this void. Restorative yoga practice offers routines so simple any novice can follow along, so gentle that even people in recovery from illness and injury run little risk of aggravating their condition through home practice (though the usual disclaimers apply). The DVD includes a very simple 12 minute meditation practice, a 15 minute morning session, a midday relaxation break, two 45 minute evening routines, and an 85 minute anti-insomnia routine. In all, it offers over four hours of the gentlest healing practices, wherein relaxation poses, supported by pillows and blankets, are held for extended periods of time, stretching and opening the body and mind and permitting the nervous system to quiet to its fullest state of relaxation. Who wouldn't want to begin and end their day in a state of quiet serenity? I recommend this DVD to any person wishing to learn simple meditation and mind-body practices for health and healing. Because the approach of this DVD is free of any attachment to a particular spiritual tradition, it would serve as a valuable resource for teaching wellness techniques in communal and academic settings, where a broad range of fitness levels and spiritual traditions are gathered together.